ROUND ROCK, Texas, Dec. 21, 2009 - Dell's hot-selling Inspiron Mini 10 netbook is getting better with a fresh new look and longer battery life to go along with technology enhancements and easy connectivity capabilities that make it a fashionable and functional must-have for on-the-go people. Updates to the Mini 10 include optional high definition entertainment bundles that deliver rich, smooth playback of streaming HD video in addition to Web surfing, email, listening to music and sharing user-generated content in real time. 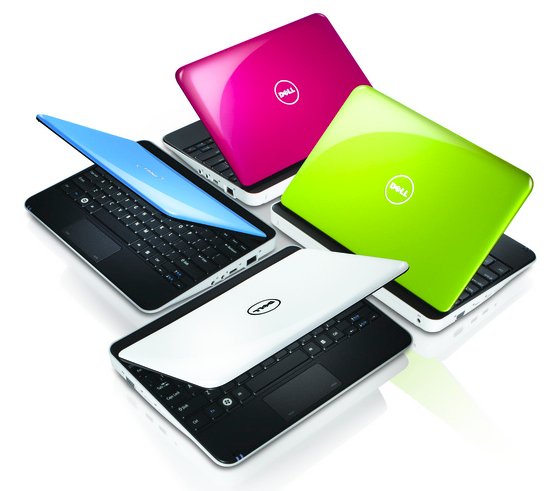 Dell expects the redesigned Inspiron Mini 10 to be available the first part of January 2010. The new design with 10.1-inch display includes a textured, smudge-resistant palm rest, sculpted keys and, for the Inspiron Mini 10 mobility bundle, extended-life battery offering up to 9.5 hours of operation. The Mini 10 can be personalized with a broad range of optional colors or hundreds of optional custom artwork designs available in the Dell Design Studio. The Inspiron Mini 10 will be offered in the coming weeks in a selection of bundles with distinct features like an HD display, Broadcom Crystal HD media accelerator, surround sound capability, built in HDTV tuner for over-the-air local HD broadcasts, or built-in Wi-Fi location enabled GPS that provides people with real time information to nearby restaurants, landmarks, maps and entertainment. Built-in wireless connectivity Connectivity: Where wireless access is available. Additional access charges apply in some locations. provides easy, quick access to the Internet and e-mail. Some models feature Bluetooth and Mobile Broadband communications Mobile Broadband: Subject to wireless provider's broadband subscription and coverage area; additional charges apply., too. Choice of 3 or 6-cell integrated battery with up to 9.5 hours of battery life (Inspiron Mini 10 mobility bundle only). Lightweight: Starting at about 2.75 – 3.1 pounds Starting at Weight: Weights vary depending on configuration and manufacturing variability. with a 3-cell battery Battery Life: Based on preliminary lab testing. Varies by configuration, operating conditions and other factors. Maximum battery capacity decreases with time and use. Battery life of 9 hours and 34 minutes for the Mini 10 Mobility bundle is achieved using Mobilemark2007 battery life testing benchmark with a system configuration that includes 60WHr 6 cell battery, Windows 7 Starter Operating system and 250GB Hard Drive. The Dell Inspiron Mini 10 is expected to be available in early January from Dell and select configurations will be available in retail outlets worldwide in the coming weeks. Prices start at $299. "The Inspiron Mini 10 continues to offer some of the best mobile entertainment options available in a great-looking, compact and lightweight design," said Brian Pitstick, general manager of Dell's mobile products. "With an even better look and great battery life, we think Mini 10 is the perfect companion PC for anyone who wants to be entertained and connected wherever they go."